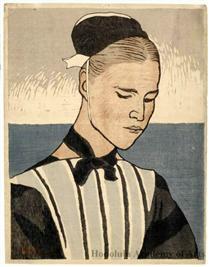 Kanae Yamamoto (山本 鼎, IPA: [ka.na.e], 24 October 1882 – 8 October 1946) was a Japanese artist, known primarily for his prints and yōga Western-style paintings. He is credited with originating the sōsaku-hanga ("creative prints") movement, which aimed at self-expressive printmaking, in contrast to the commercial studio systems of ukiyo-e and shin-hanga. He initiated movements in folk arts and children's art education that continue to be influential in Japan. 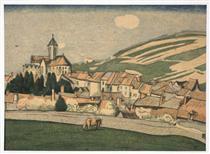 Kanae trained as a wood engraver in the Western style before studying Western-style painting. 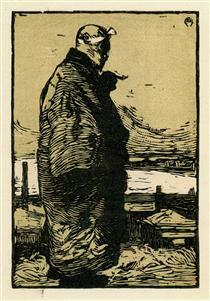 While at art school he executed a two-colour print of a fisherman he had sketched on a trip to Chiba. 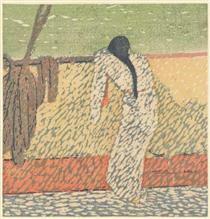 Its publication ignited an interest in the expressive potential of prints that developed into the sōsaku-hanga movement. Kanae spent 1912 to 1916 in Europe and brought ideas back to Japan gleaned from exhibitions of peasant crafts and children's art in Russia. In the late 1910s he founded movements the promotion of creative peasant crafts and in children's art education; the latter quickly gained adherents but was suppressed under Japan's growing militarism. These ideas experienced a revival after World War II. 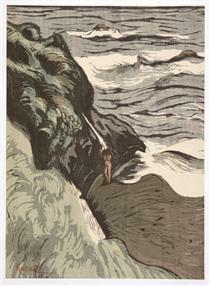 Though always a supporter, Kanae left behind printmaking in the 1920s and devoted his artistic output to painting until he suffered a stroke in 1942. He spent his remaining years in mountainous Nagano in the city of Ueda, where the Kanae Yamamoto Memorial Museum was erected in 1962. Kanae Yamamoto descended from the Irie clan (ja) of hatamoto—samurai in the direct service of the Tokugawa shogunate of feudal Japan in Edo (modern Tokyo). His grandfather died 1868 in the Battle of Ueno, during the Boshin War which led to the fall of the Shogunate and the Meiji Restoration which returned power to the Emperor. This orphaned Kanae's father Ichirō, and thereafter he grew up in Okazaki in Aichi Prefecture; how he got there is a matter of speculation. The specialist in Chinese medicine, Ryōsai Yamamoto, from line of specialists in traditional Chinese medicine, took in Ichirō with the intention of raising him to marry his daughter Take, the eldest of the family's nine children. Kanae was born 24 October 1882 in the Tenma-dōri (ja) 1-chōme neighbourhood of Okazaki. Ryōsai intended Ichirō to continue the family profession, but when the Meiji government announced it would grant medical licenses only to those who practised Western medicine, Ichirō moved to Tokyo to study it shortly after Kanae's birth. He lodged in the household of Mori Ōgai's father, where he performed household duties to earn his keep. To advance his studies he took part the clandestine digging up of fresh graves to find bodies for dissection. When he was five, Kanae and his mother joined Ichirō in Tokyo and settled in a tenement house in the San'ya area. His mother did sewing work to help support the family, and with her sister Tama provided maid service to the Mori household, and thus Kanae often met his younger cousin, Kaita Murayama, who, like Kanae, was to make a career in art. 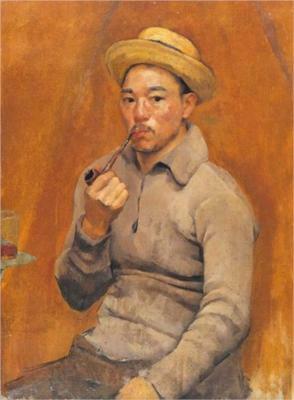 The painter Harada Naojirō, whom Ōgai had befriended when the two were studying in Germany, asked Kanae's mother, whom he had seen at the Mori household, to model for the painting Kannon Bodhisattva Riding the Dragon of 1890. 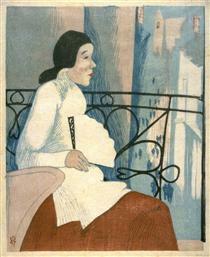 Such occurrences may have contributed to attracting Kanae to art. 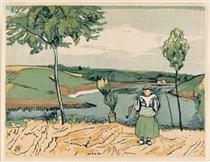 Dutch Girl In Landscape Kanae Yamamoto ? French Pastoral In Spring Kanae Yamamoto ? On the Deck Kanae Yamamoto ? unknown title Kanae Yamamoto ? Woman of Brittany Kanae Yamamoto ? Bathing in Brittany Kanae Yamamoto ?